Welcome to WikiRate, the open research platform bringing together diverse minds to design, develop, discuss, hone, populate and share metrics on corporate performance. WikiRate is a place where you can find the answers to questions that matter. Content on WikiRate is produced and maintained by the community and this page explains how it works. Join our community today to start contributing. As a member you will have a profile page sharing information about your contributions and interest areas. To view your profile click your username in the top right corner. Follow content to receive notifications when someone edits or votes on metrics or pages important to you. If you forget your password go to the sign in page and click reset password. Company profiles display both the performance and contributions from any organisation represented as a company on WikiRate. We have more than 20,000 companies on the platform, and this number is growing all the time. If you would like to add a new company click here and enter the company’s full name, location of headquarters and upload their logo. 6. Enter all relevant details and click submit. For further guidance follow these links: how to research GRI metrics, how to find values in reports, how to do conversations and calculations and how to add comments, Double-checking values. Sources can be added to WikiRate as a URL, file upload or report. All metric values on WikiRate must be traced back to a source, these can be company reports, news articles, websites and so on. To add a source click here and fill in the relevant details and make sure to tag the relevant company and select a report type. It is important to assess the credibility of a source, researchers should consider who produced it and whether they have a good or bad track record of reliable, unbiased reporting. Leave comments in the discussion box on the source details tab to make a case for whether a source is credible or not. Research Group bring community members together to organize projects, design Metric, have conversations and track progress around a Topic, theme or area. To join a Research Group, visit the page of one you would like to join and click "Join". Your name will be added to the list of members. Research groups track the work of the users who are a part of the group, in connection with a specific Project, so that you can see your progress in relation to your peers. Each group also has a place to create conversations on different topics so that you can communicate between yourselves and other WikiRate users. Open - any user can add research to this project. Once you have identified or been assigned a project to research, read over the project description. 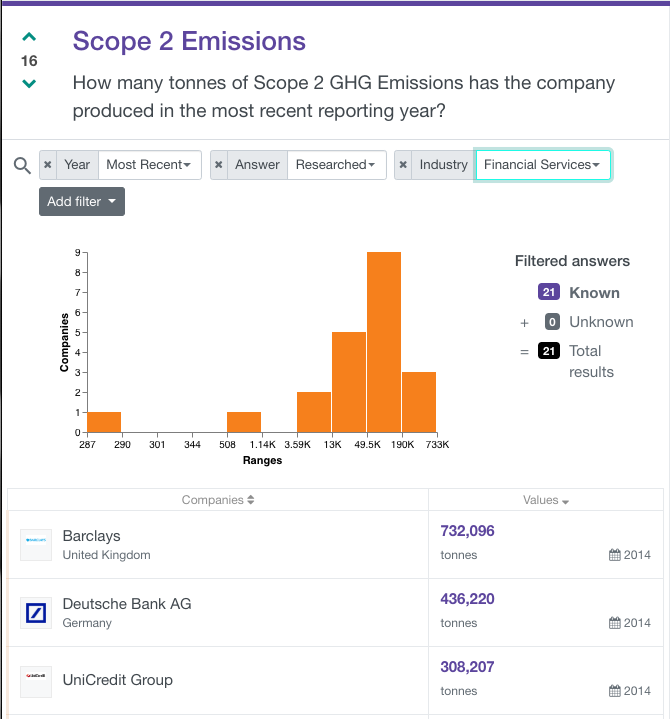 When you are ready click the research answer button next to the company of your choice. WikiRate hosts a wide range of projects, you can find the full list or add a new Project here. If there is a question about companies' performance that you think is important to know about, and there are not any existing metrics that capture this information, then it’s time to create a new Metric! Metric Name: This follows the format “Metric Designer+Metric Title. Metric Designer is the person or organisation that thought up the metric. The Metric Title is a clear, succinct title that can be shown all over Wikirate when the metric appears in a list).– for example “Total Waste Recycled”, as seen in the image below. Question: Formulate the question your metric is asking about companies. Try to be as concise and thorough as possible. Make sure to include the unit measure if relevant. 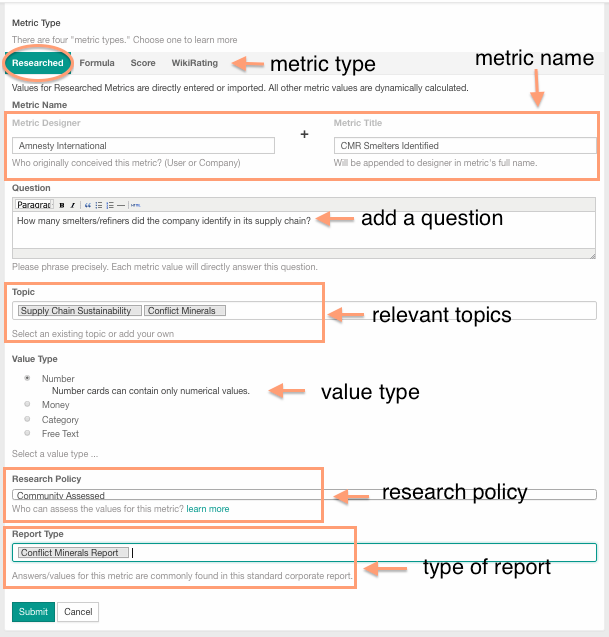 Research Policy: To allow other WikiRate users to help research values for this Metric, select Community Assessed (this is the most common Research Policy selection for WikiRate users). Designer Assessed metrics are researched by independent organisations and imported onto WikiRate - these allow only the metric designer to add new values. Report type: Select the type of report that can be used to find the values specific to this metric (CSR / Conflict Minerals). The image below shows this form as filled out. After clicking Submit, your Metric has been created, and the next stage is to fill in your About and Methodology sections. You can always add more detail or edit them after further research. About: Provide a short description of what this Metric is about, its relevance, why companies report on this and how it is valuable. Any information that sheds light on what the metric means is important to note. Methodology: Rule of thumb is to keep this simple to begin with, and improve upon it once the metric value research is underway. In the below example, we start with details from the GRI G4 compliant reports on determining the total volume of water withdrawn. If most companies only report on volumes for individual source types, then these should be added together to produce the value the Metric asks for. Noting this in the methodology helps provide clues for what others can look for in their research. The better the instructions in the methodology section, the more likely it is that people will contribute to the research effort. Units are measurements like tonnes, joules, cubic metres, etc. Look at a few different reports to see how companies report on this specific data. Do most use kWh or rather Gigajoules? Fill in the most common measure as the Unit. Range is applicable for values like percentages, which range from 1-100. In case there is no minimum/maximum amount leave this blank. Options (under Category) are created to limit answers to specific categories, such as 'Yes' and 'No'. Above the About section of the metric, there are four tabs. The Discussion tab is meant as a place for WikiRate users to discuss changes, methodologies and other anecdotes about the metric. Anything you write in this section will be added as a comment on your metric. Currently, the best way to explore answers is by using the sorting and filtering interface on Company and Metric pages. Clicking on those links will provide an export URL that will you allow to download answers with the current filters. CSV downloads will allow a maximum of 100 answers per request. To download more answers than that, you will need to alter the filters. JSON downloads produce 20 answers per page. When there are more than 20 results, the response will include at least one paging URL, which you can use to retrieve the complete list. Project pages also contain download URLs, which can be used to download answers associated with a given project. Tickets are the best way to report issues with the platform. If you encounter any problems when using WikiRate we encourage you to submit a ticket or see if other users have encountered similar problems. This video demonstrates how to submit a ticket on WikiRate. When possible include the URL of where the problem occurred and take a screenshot, this will help the developers fix the problem quicker. Once a ticket is submitted the WikiRate Team will try to respond as quickly as possible. Start a new discussion if you have broader questions that you would like to discuss with the WikiRate community. Get in touch with the WikiRate Team at info@wikirate.org and we will do our best to help.